Having lots of people with lots of voices isn’t a weakness—it’s a strength. The women's march on Washinmgton DC. Credit: Liz Lemon/Flickr. Some rights reserved. We hear this a lot on the Left. We say it a lot. It’s almost an article of faith. But the more I think about it, the more I can’t agree. Outcries against infighting are understandable – but they ultimately don’t make sense. They’re often self-serving; they divide more than they unite; they disempower the people who most need more power; and they undercut our basic identity as a movement. We have important differences on the Left. We disagree about tactics, strategies, priorities – even about our ultimate goals. We disagree about radical versus incremental change; identity politics versus class politics; which kinds of civil disobedience are called for and when; which compromises are necessary and which we can’t accept; and many, many more issues. These are important differences. We need to settle them. We need to make decisions and move forward: in our small working groups, in our large organizations and big national events, and within the movement as an amorphous, impossible-to-define whole. How are we going to do that if we aren’t willing to have conflict? 2. Without infighting, who gets to make decisions? We have hard decisions to make. We don’t have the resources to do all the things we want to do – and we don’t all want to do the same things anyway. Who’s going to make these decisions, and how? Do we sit back and let our leaders do the thinking and deciding? That’s not who we are. That doesn’t reflect our values. And even if we were going to do that, which leaders would we follow? Labor leaders? Media voices? Heads of civil liberties organizations? The heads of the Democratic Party – and if so, which ones? To some extent, we can each make our own decisions about who to listen to and what action to take. But if we’re taking collective action, if we’re working together in groups small or large, we need to make decisions. How do we make them? If we operate by anything resembling consensus or democracy, that means conflict. And if we do choose a leader to be the decider, that doesn’t relieve us of conflict. We still have to decide, not only who to follow, but when and if to stop following. We have to keep our leaders accountable. We have to pay attention to what our leaders are doing and where they’re going, and we have to decide every day whether we’re okay with it. And at some point, we’re likely to have conflicts about that. In the months since the 2016 election, the Left has been galvanized. It’s been amazing: People who have been bemoaning how weak and half-assed the Left has been should be sitting up and cheering. And this uprising is so strong, in part, because it’s coming from the ground up. But that has some consequences. A grassroots movement is a movement led by a thousand people at once. That’s going to mean conflict. And conflict, again, is just another word for infighting. 3. Diversity is one of the things we’re fighting for. The Left is a highly diverse movement. We’re not as diverse as we should be, but we’re certainly better at it than the Right. And diversity means differences – which need to be worked out. Every group wants its issues to be addressed, to be more of a priority. That’s appropriate. That’s exactly how it’s supposed to work. And every group (and every person within every group) has different ideas – not just about which issues to work on, but about tactics and strategies, priorities, and goals. Diversity doesn’t mean a saccharine children’s painting of varied people holding hands and smiling. Among many other things, diversity means accepting that we have differences – sometimes major differences – and finding ways to resolve our conflicts that don’t screw people over. 4. Concerns about infighting suppress marginalized people. This is one of the most insidious things about pleas to stop infighting. All too often, they punch down. They get aimed at marginalized people speaking out about problems within progressive movements. So the calls for unity create the very divisiveness they’re supposedly trying to stop. The people who get divided out are the people who complain, and are told to shut up. Remember the Women’s March? Remember how women of color speaking about racism in the march were chided for being divisive? 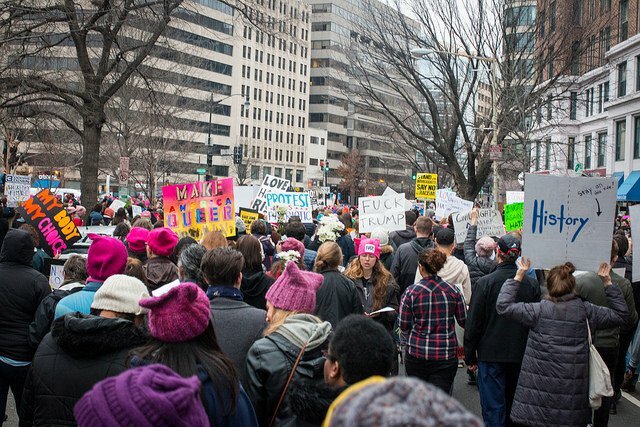 When white women working on the march were told they were being racist, many responded by saying their feelings were hurt. They made their hurt feelings a greater priority than the racism, and they insisted that women of color needed to stop talking about white supremacy because it was divisive and the march needed unity. White, cisgender women needed unity, anyway. The idea that “unity” might mean listening to black and brown women when they call you on your crap? Some white women got that. A lot didn’t. It was tremendously frustrating: Women who rage against these exact silencing tactics when they come from men were turning around and aiming them at other women. And it discouraged a lot of black and brown women from participating in the march. I’ve dealt with this for years in the atheist movement. For years, when atheist women and people of color spoke about racism, misogyny, harassment, sexual assault, and the rise of the so-called “alt-right” within the movement, we were told to keep quiet because we couldn’t afford divisiveness. Yeah, that worked out great. Ignoring the trolls was an awesome idea. Ignoring the rise of the racist, misogynist alt-right; giving it a home in our communities because we didn’t want to be exclusionary (not to white men, anyway); giving it a home in our online spaces because free speech was falsely equated with giving a platform to fascists – that worked out great. Oh wait, no. Strike that. Reverse it. Ignoring the alt-right was interpreted as tacit approval. The shitlords camped out in any atheist space that would let them. They drove marginalized people out, creating the very divides the status quo warriors were supposedly concerned about. And they used these spaces to embolden each other, spread disinformation and hatred, make their positions seem mainstream, and build their movement. The deep rifts in organized atheism, as painful as they’ve been, are some of the best things that could have happened to us. They’ve given the social justice advocates in our movement the freedom to quit beating our heads against the wall and just create our own damn communities. And this story is all too common on the Left. We should know better. 5. The line between infighting and healthy debate often gets drawn in self-serving ways. There are worthwhile conversations to be had about how to have conflict. But it’s kind of hilarious how blatantly self-serving these conversations can be. Healthy debate is when conflict goes the way I want. Infighting is when it doesn’t. I’m debating. You’re infighting. They’re creating deep rifts. And there’s a special irony in picking fights about how people are fighting too much. Those meta-fights are apparently okay and even necessary. The actual fights about our actual differences? That’s divisive infighting. Bad! 6. Infighting isn’t a weakness—it’s a key part of who we are. The fact that we don’t march in lockstep behind authoritarian leaders is one of the things that sets us apart from conservatives. It draws people to us. It makes us who we are. And it’s one of our greatest strengths. I once saw a talk advising progressives about media presentation. I wish I remembered the speaker’s name, so I could credit him. One of the things the speaker said – something that’s stuck with me for years – is that when it comes to media management, conservatives are very good at sticking to the party line. No matter what news outlet you tune into, you’ll see every right-wing pundit saying the same thing. And then the speaker said that progressives shouldn’t try to imitate that. It’s not what we’re good at, we’ll never be good at it – and it’s not who we are. What we are good, he said, at is coming at an issue from lots of angles. We’re good at showing why our view is fair, why it’s economical, why it’s good for jobs and the environment and national security, why it fits our country’s best visions of what we should be. We’re good at showing how the issue affects families, women, students, retired people, poor people, disabled people, people of color. We’re good at offering hard evidence, insightful analysis, and human stories that tug at people’s hearts. We get at an issue from lots of perspectives – and when we do that well, we connect with a whole lot of people. That’s who we are. We aren’t a movement that values authority and conformity. We don’t just want the people at the top to be heard. We’re a movement that values fairness and kindness – for lots of different people. We’re the ones who want to make sure the unheard are heard. Even when we don’t live up to those values, they’re what we strive for. And striving for those values means accepting the reality of conflict, and the necessity of resolving that conflict. There is a line between conflict and abuse. We need to have conversations about where to draw that line, and we need to keep an eye on it. And right now, in the current apocalypse, maybe we should be more thoughtful about which internal fights are worth it and which we want to let go. But in the current apocalypse, we also need to make sure that everyone who’s endangered by the rise of fascism is heard. Democracy is hard. Equality is hard. Lots of people having voices and wanting to be heard– that’s hard. But when we do it well, we are at our best. Let’s not stifle it.